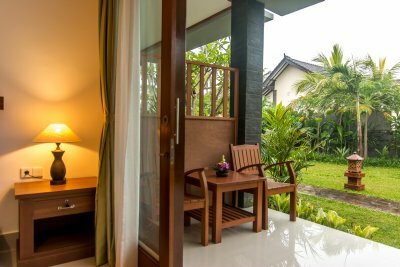 12 suite bedrooms are arranged in three main buildings in order to get the perfect angle to be able to capture the best scenery of rice fields or tropical gardens from the private terrace of each room. 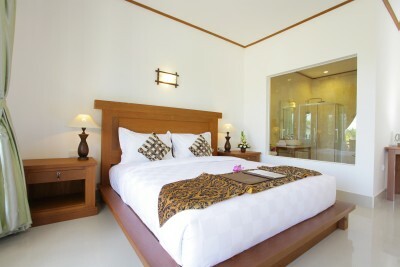 6 Suite room designed in higher level to get wider view of surrounding garden and rice field . The feeling of rustic ambiance of traditional Balinese village can be felt from every angle. Another 6 rooms designed at ground floor, the tropical garden attach with stepping down from balcony, guest easily can access to the main swimming pool from private balcony through stepping down which connected with a path way along the shady garden. 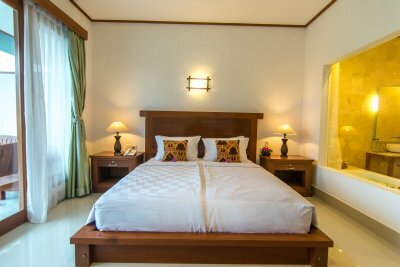 Our hotel section feature for Suite room with suitable for long and short stays. Guests can enjoy the home feeling in Ubud with Genuine hospitality staff. Spending time by relaxing in public swimming pool, with its row of sun decks and do pleasant socializing with other guest as new family of Gita Maha hotel. However, back in the individual room, the privacy is maintained. 12 suite rooms are provided references of our guests, Double room and Twin Holywood is well set up as guest need. Luxurious facilities such Private Balcony with coffee table, LED Flat TV 32 inch with Local Chanel which introduce you more of Indonesian culture, DVD Player with mini home teater ,selection of culture movie is provided, refrigerator, digital safety box, tea and coffee maker, individual AC control, a set of dining table or Sofa. Well designed Bathroom where guest can enjoy view from Bath tub along private balcony, hot & cold water , standing shower, dressing table, hair dryer, toilet with hotel standard amenities usi herbal soap and shampoo.